On Saturday, May 21st Colonie Central High School held the 3rd Annual Raiderfest organized by their very own iCare team. Raiderfest is an all day event with the intent of uniting the local community. iCare operates on the core values of integrity, Community, Accountability, Respect and Empathy with the purpose of uniting the entire population of Colonie. The day started out with a ceremony dedicated to the men and women of the U.S. armed forces and the induction of the “Hill of Heroes”. 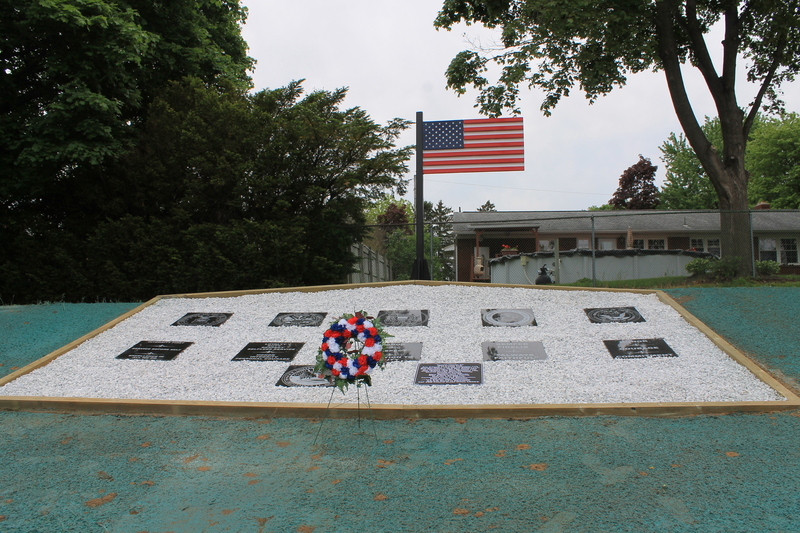 This memorial includes a 400-pound steel American flag along with granite blocks paying tribute to the five branches of military. The project was spearheaded by John Lawlor, a Colonie High student who graduates this year. Lawlor’s father, also a Colonie graduate, is in the Air Force. Lawlor said he came up with the idea to better recognize the sacrifices of those like his father who serve their country. This school year iCare is focusing on educating and raising awareness for the active service men and women, as well as veterans. 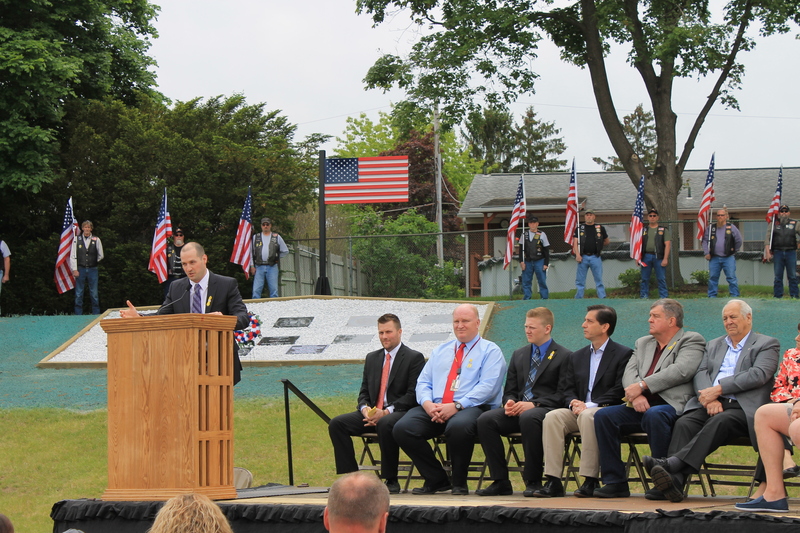 The money that was raised from this year’s event will be donated to Solider On, Blue Star Mothers of America Inc., and The American Gold Star Mothers Inc. At the dedication ceremony Dominick Sondrini, Soldier On’s Field Supervisor, spoke on behalf Soldier On. Sondrini shared the various programs that Solider On offers throughout the area. He also thanked the iCare team, Colonie Central High School, and Lawlor for their commitment to bring veteran awareness to their community. Jane Geary is a veteran of the United States Navy. She is a graduate of the Soldier On Women’s program, and she has made remarkable progress in her time there. Two Years ago, Jane’s world changed forever. Her husband of 18 years died which left a seemingly insurmountable emotional void in her life. Like many others who are faced with tragedy, she turned to alcohol to fill this void. As she continued to spiral downward she found herself being treated for substance abuse at Heywood Hospital in Gardner, Massachusetts. She was then admitted to the VA Hospital in New Bedford, MA where she was referred to the Soldier On’s Women program. Though Jane eventually embraced and excelled in the program, the transition was very difficult. According to Jane, she spent the majority of her first 45 nights at Soldier On up all night depressed and crying, and would sleep during the day to get away from her problems. Soldier On’s relentless support during her difficult transition laid the ground work for her future success. Gradually, Jane became more comfortable in the program and began to actively participate. She realized how effective the resources at her disposal could be if properly utilized. Instead of focusing on the substance abuse issue on its surface, she was taking steps to treat the underlying problem as she was suffering from PTSD. This was caused by several events including child hood trauma, Military Sexual trauma, and the death of her husband. She found utilizing Prolonged Exposure therapy, a method of therapy where the traumatic event is re-experienced through conversation instead of avoiding the memory, was a game changer in managing her PTSD. Goal setting became an effective tool for staying on track and focused. She set several goals for herself including; attending AA meetings, buying her own car, staying engaged on a daily basis, and her ultimate goal of getting an apartment in the community to live on her own. By utilizing services assisting wellness and finance she accomplished these goals. When Jane first came into the program she was not utilizing any of her VA benefits. With the help of program director, Sara Scoco and wellness director, Stephanie Ovitt, Jane was given the resources to become 100 Percent service connected which put her at a point where she had enough income to afford to live in an apartment on her own and purchase a car. Jane was successfully discharged from Soldier On Saturday, May 7th to move into her own apartment in Leeds, Massachusetts. She will continue to be involved in the women’s program by serving as a mentor and attending alumni events. All of her hard work in the program has set her up for sustained success in the community.